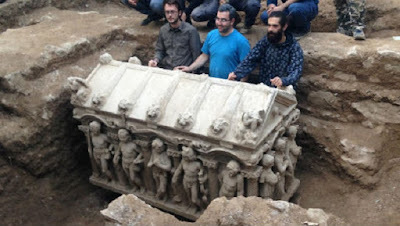 A late-Roman era sarcophagus thought to be belonging to the Late Roman Empire was unearthed and transferred to a museum after it was found by a farmer in Turkey's İznik district of Bursa last week. The sarcophagus weighing nearly 7 tons was found by farmer Hatice Süren, who went to an olive grove near the Hisardere area, last week. She informed the gendarmerie and excavations were launched in the area to unearth the sarcophagus. Archaeologists found out that the sarcophagus had been partially damaged by treasure hunters.